ALL MY LIFE, it’s been Hitler this and Hitler that. For me, it was like the Norm Macdonald joke, the more I heard about the guy, the more I didn’t care for him. 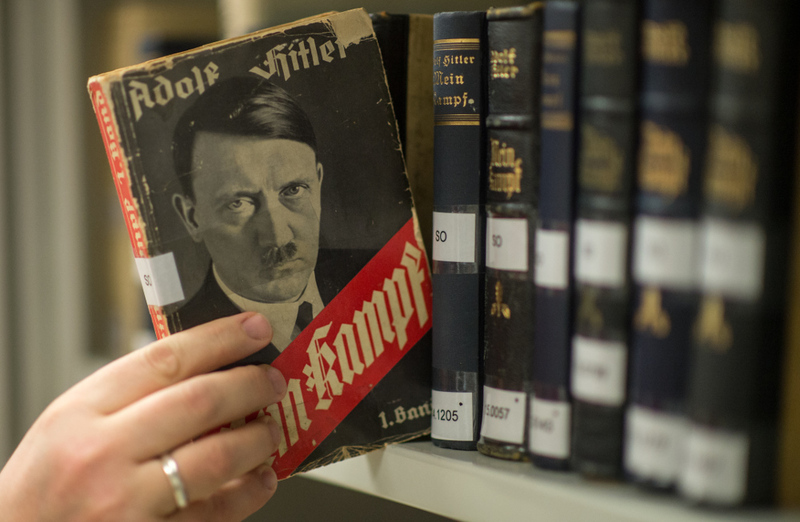 Finally, I took it upon myself to read Hitler’s magnum opus, Mein Kampf, and see what I could pick up about him for myself. Hitler dictated Mein Kampf (My Struggle) while he was in prison for an unsuccessful putsch (political insurrection) in November of 1923. The book gives his account of his life, outlines the ideology of National Socialism, and relates the history of the National Socialist German Worker’s Party (commonly known as the Nazi Party) and its plans for the future. The book was published in two volumes, in 1925 and 1926. It became a best seller in Germany, though with its 688 pages of pedestrian prose, it might have been more purchased than read. burn the racial sense and racial feeling into the instinct and intellect, the heart and brain of the youth entrusted to it. No boy and no girl should leave school without having been led to an ultimate realization of the necessity and essence of blood purity. Thus the groundwork is created by preserving the racial foundations of our nation and through them in turn securing the basis for its future cultural development. For all physical and all intellectual training would in the last analysis remain worthless if it did not benefit a being which is ready and determined on principle to preserve himself and his special nature. I think that anyone with a good mind and a decent sense of ethics would have to conclude that Mr. Hitler’s National Socialist program was far more conductive to Aryan health and liberty than any government that’s ever been implemented on earth in recorded history. And I think that you have pretty much grasped the major points of the late Führer’s convictions! Good essay. If the people could know Adolf Hitler, if the people could have access to his thoughts and to the real facts of history, they would fulfill the latest prophecy of this great man: “My spirit will raise from the grave, and the world will know that I was right”. May the Almighty Creator let my sons see that day. GOD bless Adolf Hitler, the Comrade, the Wolf, the Führer of the Germans, and the Champion of Aryans. Aside from feminism, abortion, war, etc. that have decimated our population numbers, it’s this absurd idea, sold to us by Hollywood, of finding one’s “soul mate” that also keeps people single longer, which always results in fewer or no children. People spend years trying to find someone who meets all the criteria on their list that will make them allegedly happy. In addition to all the other propaganda wars, we often forget how the “you complete me / I married my best friend” nonsense works against us. On the ‘rickety herd’, I do wish we had a way to meme, or otherwise make customary to the Occident, a primacy of marriage and reproduction geared or otherwise set as firmware; so as to abide by correctly consanguineous fourth cousin marriage. Sounds mad at first, yet so much more so is this wretched judeo-modernish hell we now witness. To coarsely assert it, the vast majority of whites are all at this point mere bastards by blood, in a sea of judeo-globo-homo bastards biologically mortgaged by their anti-racial subversion. We feel the negative bio-hypothecation of this reality in obvious cases of miscegenation, in marital alienation or child-parent ennui. Even in ideal white families dedicated to saving the white race are not, this specific issue considered, not making much of a contribution; but just paying the interest. To get to the principal, we must let or punish, the grotesque failures and betrayals of our subverted institutions, who in past might have rendered this wisdom of biological husbandry into our culture and civilization be left to their irrelevance in the past. We now actually do have the tools to do this; digitized ancestry records, professional genealogy services, multiple genetic testing services and recent scientific realities which prove that reproductive optimization – actual productive, profitable family formation is possible. At optimal fourth cousin distance, 1/512th of genetic mutuality is conserved. Closer collapses too much pedigree, resulting in deformed ad diseased biological loss, and too far produces these auto-alienated existentially ‘individualistic’ bastards, no matter their ideological claims to nation or race. Instituting an Occidental custom of fourth cousin (mutual grandparents grandparents) marriage, with algebraic optimization for multiple suitor scenarios would do a lot to decrease the negatively provocative behaviour of young white women — focusing them instead on ancestry, heritage and real cousinry suitors during early flushes of reproductive desire, while also acutely recognizing and giving specific purpose to her reproductive function as a core biological jewel set in her coverture value; to her father, family, tribe, faith, nation and race. Such a custom would also stabilize the anarchic pan-sexual mayhem that we witnessed in the baby boom, thus controlling the broad asiatic invocation of angst and degeneracy destroying our men and their civilization. Imagine the horror of these ever revolting jews, when five or six generations of properly consanguineous white marriages have unfolded. When we have restored an essentialist network of blood strong enough to capture and expel their anti-race (((cousinhood))). I read writings like this and concluded that Hitler seemed right, and visionary, about many things. Then I wonder: What if he had not invaded Poland when he did? What if he had not let the enemy escape at Dunkirk? What if he had not kept getting bogged down in places like Stalingrad and just gone straight for Moscow? So many amazing accomplishments but in end, so much destruction and death, especially for his “volk”. Can we have only the good side of this coin but not the bad? How? the jewish reality we all confront. It makes sense. It makes sense regardless of skin color or creed. Anybody with the ability to think for himself or herself can benefit by these principles. If we can move past the false idea that there is only Capitalism or Communism, then we can re-discover and embrace a more natural-human centered belief system that builds and that brings strength to the family, to the community, and to the nation. There is a proper way to work out our life that brings blessings, and then there is what we have been doing for the last 100 years or more that has been bringing disaster to our families and to our communities.